I remember enjoying this when I’d read this a couple of years ago, but I’m not exactly sure what happened here. As an antihero, Macbeth sure spends a lot of time not going through with his plans and continuing to chicken out. 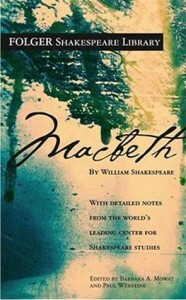 Paired with him is Lady Macbeth: whereas Macbeth doesn’t have enough guts, Lady Macbeth doesn’t have enough sense of understanding that not everyone is a bloodsucking power leech. Consistently throughout the book, I thought there was a little too much focus on Macbeth being hesitant that he seemed more of a reluctant villain in the beginning than an antihero. One of the themes that intrigues me the most, was the supernatural aspect. Macbeth pretty much loses common sense after listening to every prophecy, and despite the prophecy coming true of him becoming King (which he forces, so it’s not really true…), he believes he has the ability to stop the exact same power that crowned him King even though he’s trying to change fate. Macbeth, in the end, makes the same mistake that all the prophecy believers make: misinterpreting the words and misunderstanding the meaning of the prophecy. This, eventually leads to what is known as the tragedy of Macbeth. I feel bad for the real Macbeth, though. He isn’t really remembered as the decent King that he was in real life. Just, the person Shakespeare made him to be.